It’s not often you see a sport boats of this size hit all of the marks, however the Formula 400 super sport seems to do just that. The Formula 400 comes well equipped with advanced technology features as standard including chartplotters, remote LED white/blue cockpit lighting, updated LCD HDTV/DVD, separate audio system tweeters and iPod™/MP3 ports. They also offer an impressive array of optional extras and upgrades such as navigation electronics, engine monitors, satellite TV and DTS control systems. The joystick control technology offered with either the Volvo IPS or MerCruiser® Axius™ system provides excellent control while docking or manoeuvring in tight places. The 400 interiors are very impressive also offering practicality and comfort with that feel of design over function quality. The lounge has an inspired invitation with it sleek solid wood table and smart décor pillows topped with luxurious leather. The wood has a high-gloss, Deep Cherry finish as with the flooring. The plush, subtly textured carpeting is new for 2009, as well as all other décor fabrics. The Formula 400 also presents four upscale designer fabric themes by Tommy Bahama and Ralph Lauren. Finally the cockpit design is a great place to be as a spectator lounging in style or at the helm blasting over the waves. 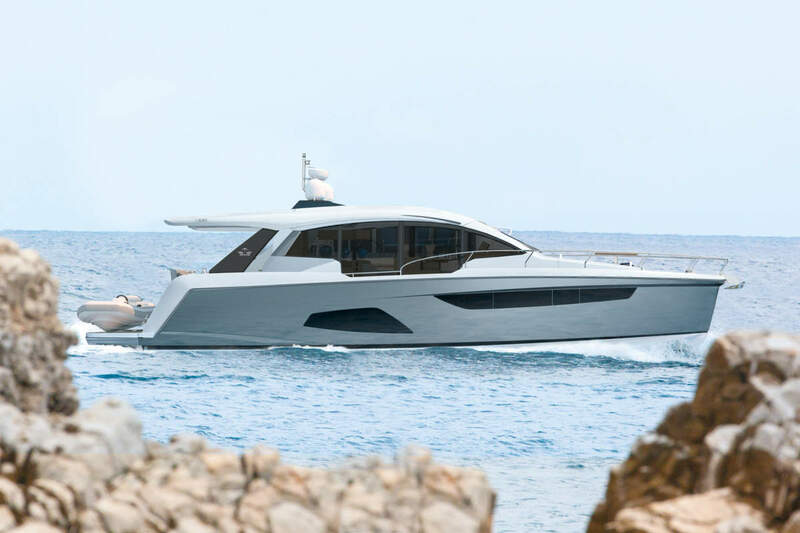 It has a non-cluttered feel and a sophistication about it that would suit much larger boats of its size. Comfortably contoured lounge seating and adjustable tables provide creative versatility, and the integrated wetbar is a simple nice touch for those entertaining experiences. The aft lounge along with tables and filler cushions becomes a generous sunpad. The foredeck has two generous sunbrella sunpads for those who wish to be at the front of the action easily reached by way of the walk through windshield, a hallmark Formula cruiser feature. Formula continue to advance with their ranges and 2009 will bring no disappointment from the American manufacturer.